We are a family run business based in the North East of England covering County Durham & North Yorkshire areas. 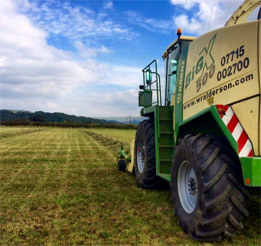 In 1991 we started large square baling adding many services to our portfolio over the years and recently we offer forage harvesting from field to clamp . We offer a very flexible,reliable and cost effective service. Our customer base is very varied so expect different methods and also equipment. We can break up the team to suit your needs whether you wish to pull our trailers or your own or even just chopper only, its up to you and priced to suit. We offer a very reliable baling operation from straw with our modern kit right through to bale chasing and stacking. We have everything covered, square or round. Field wrapping gives you the most reliable method of baled silage making and our speciality horse haylage. Once a baler pressurises grass, it warms immediately so needs wrapping straight away. Thus protecting your investment. SERVICES we have added are slurry applicating with umbilical or tanker. We can inject, dribble bar, or simply splash plate. The choice is yours and prices are very competitive. In our many years experience we have found customers in our locality expect reliability and expertise, not often found. Not just in machine operation but understanding what customers want, communication and giving sound advice when required. We offer many other services please follow the links and tabs on our site.